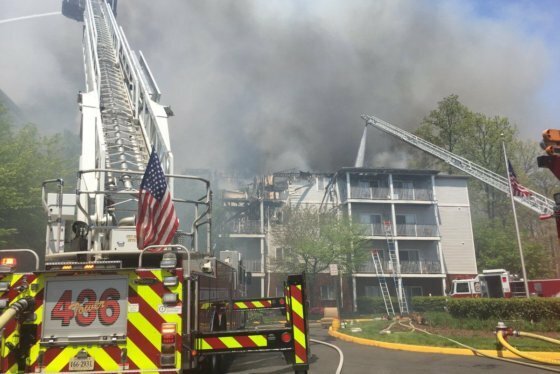 A local nonprofit is collecting donations of gift cards to help out the approximately 125 senior citizens who were displaced following a fire in Fairfax County on Wednesday. Here's how you can help. WASHINGTON — After a fire ripped through a senior housing complex in Centreville, Virginia, Wednesday and displaced approximately 125 residents, a Fairfax County nonprofit is accepting donations of gift cards to help those who lost everything. Volunteer Center of Fairfax is accepting gift cards at their office located at 10530 Page Ave. Saturday and Sunday from 10 a.m. to 5 p.m.
Donors can also drop off gift cards next week Monday through Friday from 9 a.m. to 5 p.m. at the office or mail them to 10530 Page Ave., Fairfax, Virginia, 22030. The gift cards will help the displaced senior citizens buy food, clothing, household items and other necessities. A Red Cross spokesman said the displaced residents of Forest Glen Senior Apartments will not be returning to their homes anytime soon. Paul Carden with the American Red Cross National Capital Region said the situation will require long-term planning strategies for the residents. According to the Fairfax County Fire and Rescue Department, no one died during the fire that caused over $10,000,000 in damages. The fire was caused by the improper disposal of smoking materials, said the department.